Kodak went bankrupt because they didn’t adapt to the digital trend properly. They missed a great opportunity of having a great reputation in the camera industry and being in the business for over 100 years. Amazon made some of the book store chains out of business, such as Barnes & Noble. Facebook beat Myspace. Messenger phone apps, such as WhatsApp, made Microsoft Messenger disappear. Instagram beat Flicker. In 4 years, Samsung increased dramatically its market share of the mobile devices from almost nothing to the largest market share (see chart below). Will history repeat itself with Google or one of its brands? In the beginning of Google as a company, the first thing comes to someone’s mind when it’s mentioned is that powerful search engine. Today, people use the term Google as a verb meaning to search for something on the Internet, such as, google it. 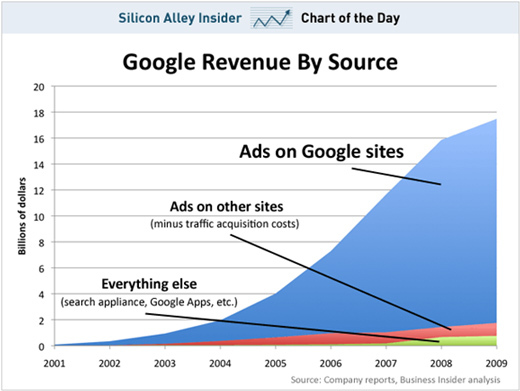 As google getting bigger and bigger, it’s becoming that massive tech company. However, the main brand or aster of Google which made it poplar or existed in the first place is the search engine service. In addition the company’s name, Google, is the same brand name of the search engine service. Google’s main business model is collecting online data about Internet users to generate online targeted ads for organizations where its most profits come from. Therefore, it’s mostly an online advertising company that depends on online data. Google has bought YouTube and Waze, a map app, to add them to its different types of search engine services. Google has started providing other products/services in the technology industry, such as, Chrome, Blogger, Google plus, Android, Google Glass, Google car, Nexus devices and Chrome cast. They have connected Google plus to other Google services. For example, they forced YouTube users to use Google Plus. They have provided great services to keep consumers using Google brands. Therefore, they want to have online data insights as much as possible to use it for online ads (AdWords) on Mobile and Web. For example, Google Now is a feature on smart phone that give a better user experience, such as, places nearby, where you parked, your home, your work, activities nearby, traffic and time between your current location and the place you’ve been to and the one on your calendar. However, people who care about their privacy, this feature is not for them. "In fact, search engines index less than 10% of the entire web! That remaining 90% is called the 'Invisible Web', or in other words, 'The Cloaked Web' or 'The Deep Web'," Paul Gil, Internet Basics Expert. The world has come a smaller place, online. Nowadays, it’s easier to start a business, especially online, than before. When consumers are looking for products/services, they go online to find and/or read about them. Online businesses have emerged that provide search engine, products/services marketplace and/or online ads service platforms for a specific area/filed. Books and shopping: Amazon, Ebay…etc. Hotels and flights: Priceline, Booking, Kayak…etc. Hotels and attraction places reviews: TripAdvisor, Booking, Yelp...etc. Apartments: Apartmentfinder, Apartments, Trulia, Zillow…etc. Flexible work spaces: Liquidspace, 42floors, ShreDesk…etc. Their revenue comes from referral/commission, ads and/or selling products/services. The list of these type of businesses is very long and it will get longer. Each platform focuses on one area, so if you are a restaurant you’d rather advertise on Yelp and enhance your profile and SEO on Yelp not on Google. Google has been distracted by focusing on other offering products/services, rather than focusing on what it’s known for, a search engine platform, in addition to Google’s main revenue from ads due to the massive data they have about online users. Therefore, Google might miss a great opportunity of being the best search engine and has not been taking a good advantage of it. Usually, the first business introduced well in a certain category and keep doing a great job will be the dominant company in that category. Today, Google is trying to provide verity of services to fight back other brands, so they do not lose its market share in the search engine platforms and online advertisement industries. They bought YouTube to have a video search engine. They bought Waze to not lose Map search engine. Google Plus to fight back Facebook. Local business with reviews and ratings to fight back Yelp. They added Books and Shopping features to fight back amazon. They added Flights and Hotels booking features to fight back flight and hotels search engine and marketplace platforms, such as, Priceline and Booking.com. Google has realized the threat of these search engine, marketplace and/or online ads service platforms. However, it might be too late. These type of platforms have been emerging dramatically. 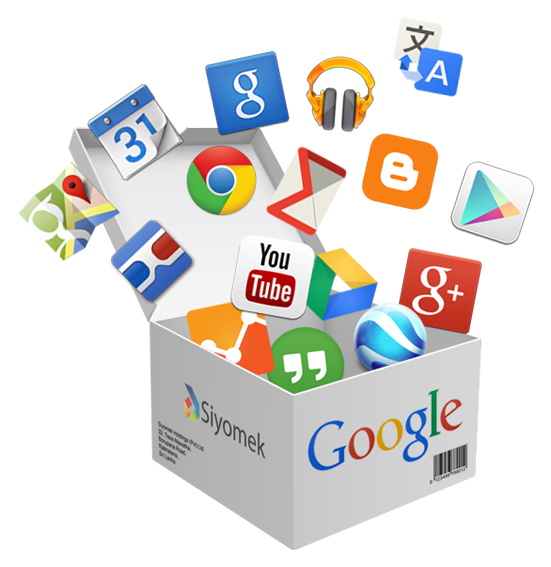 In the near future, there will be search engine, marketplace and/or Social Media platforms for every specific area. 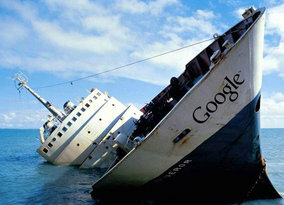 Will Google lose most of or all of its market share in the search engine platform and online ads service industries? Do you think these indicators will make Google Company and/or Google search engine platform and online ads service go down? Is it too late for Google to catch up? If not, what should they do?